Near tears, with her voice cracking, Oscar-winning actress Angelina Jolie accepted the U.N. Correspondents Association's first Citizen of the World Award for her work with refugees. Jolie, a goodwill ambassador for the U.N. refugee agency since 2001, told the awards dinner Wednesday night that she was "inspired and humbled" to work with refugees. Ruud Lubbers, the U.N. high commissioner for refugees who introduced Jolie, said the actress has extended her work with the refugee agency for another two years. "She has helped put the spotlight on a disenfranchised group — refugees — and also those who are not in the headlines and who are victims of long forgotten crises," Lubbers said. "She gives a voice to millions of uprooted people across the globe." Jolie, 28, said it was exceptionally meaningful to receive an award named for Sergio Vieira de Mello, the top U.N. envoy to Iraq, who was one of 22 people killed in the Aug. 19 bombing of U.N. headquarters in Baghdad. 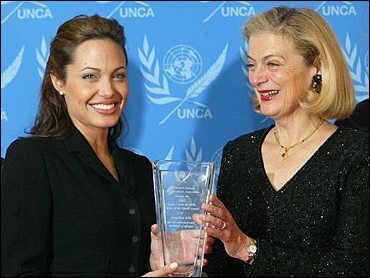 Every time she looks at the award, Jolie said, she'll be reminded of the work he did for the United Nations, not only in Iraq but also for refugees and in promoting human rights. Jolie won a supporting-actress Oscar for 1999's "Girl, Interrupted." Her movies also include the "Lara Croft" films and "Beyond Borders," which opens in theaters Friday.